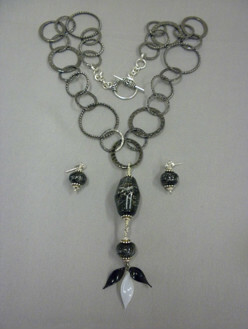 This is a necklace set made by Karen Kubby for her mother, Marilyn Kubby with the cremains of her father, Col. (Ret.) R.S. Kubby. The pendant hits at Marilyn’s heart, allowing her to feel close when she wants. Marilyn wears this other times to just look good. Beadology Iowa offers glass keepsake beads integrating the cremains of a loved one that has passed away. These beads can be made into jewelry or left as individual remembrances. The glass features the cremains which are entirely encased. The results resemble a galaxy explosion and makes for a visually interesting and emotional physical memento of a loved one. The remains may be that of a human, companion animal, or beloved livestock. 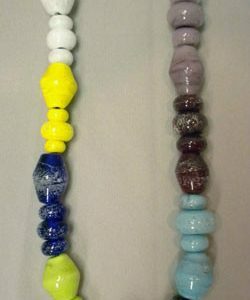 Pictured here are a 8 opaque colors–from left to right white, yellow, cobalt, pea green, black, turquoise amethyst, and pastel purple. Please scroll down to the next item to see a sample of the transparent colors. It is best to call to order cremain beads and we can arrange to get the remains from the cremation process from you. We can email you pictures of individual colors if that is helpful. Please reach us at 319 338-1566 to discuss details and ask any questions. Samples are available for viewing at the store. Beadology Iowa offers glass keepsake beads integrating the cremains of a loved one that has passed away. 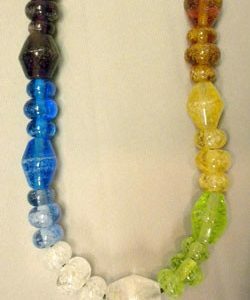 These beads can be made into jewelry or left as individual remembrances. The glass features the cremains which are entirely encased. The results resemble a galaxy explosion and makes for a visually interesting and emotional physical memento of a loved one. The remains may be that of a human, companion animal, or beloved livestock. Pictured here are a 7 transparent colors–from left to right purple, dark aqua blue, light blue, green, yellow, and medium amber. Please scroll up to the item above to see a sample of the opague colors. It is best to call to order cremain beads and we can arrange to get the remains from the cremation process from you. We can email you pictures of individual colors if that is helpful. Please reach us at 319 338-1566 to discuss details and ask any questions. Samples are available for viewing at the store.